You might have heard recently about big demonstrations going on in Poland, starting this past weekend and continuing. You would have particularly gotten such word if you pay any attention to my own EuroSavant twitter-feed, whose above-average level of Polish developments has lately been caused by an abnormal flood of such news within the feed I myself use to source most of the foreign-language stories that I pass on there. I know you are afraid of the truth, but don’t try to wipe away your treacherous murders using my brother’s name. You destroyed him, you murdered him, you are all rogues! Murder? His brother? Well, that would be his twin brother, Lech Kaczyński, who back when he was serving as Poland’s President in April, 2010 – i.e. more than seven years ago! – was killed along with almost a hundred other high-ranking Poles in the tragic Polish Air Force plane-crash near Smolensk, Russia. 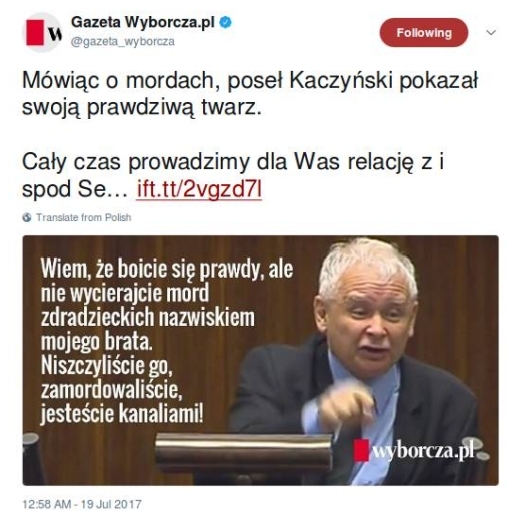 Evidently, then, Jarosław Kaczyński has convinced himself that that tragedy was no mere accident but an assassination; apparently, he also thinks the political opposition, represented within the Sejm, was also somehow responsible. Or at least he wants to make it look like he is convinced of such sensationalist allegations, perhaps to rile the political waters and increase the chance of getting the measures he wants passed in the confusion. There is a YouTube video of Kaczyński delivering those brief but very inflammatory remarks. Yes, it’s all in Polish, it’s also short, but you can see the outrage on the other side of the chamber in reaction to what he comes up and says. Meanwhile, the guy sitting up front who is supposed to be responsible for the maintenance of order within that legislative body – I have to assume he is the Sejm’s so-called “Marshal,” Marek Kuchciński – keeps ringing his little bell, trying to get people to calm down, until that bell literally breaks (you see that in the video – cheap Eastern European iron-work!) and he has to turn to a back-up. 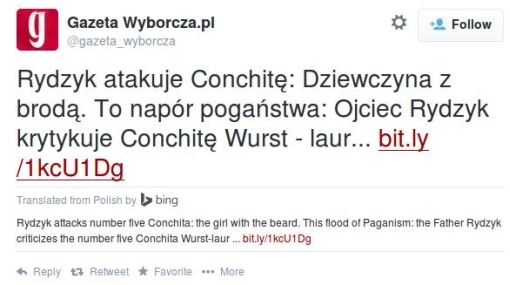 That particular tweet given above comes to us via Gazeta Wyborcza, and that is significant in itself. The PiS has already managed to enable the government to hire-and-fire personnel for the main state-owned national TV and radio networks, but when it comes to newspapers there still remain a number of independent voices. 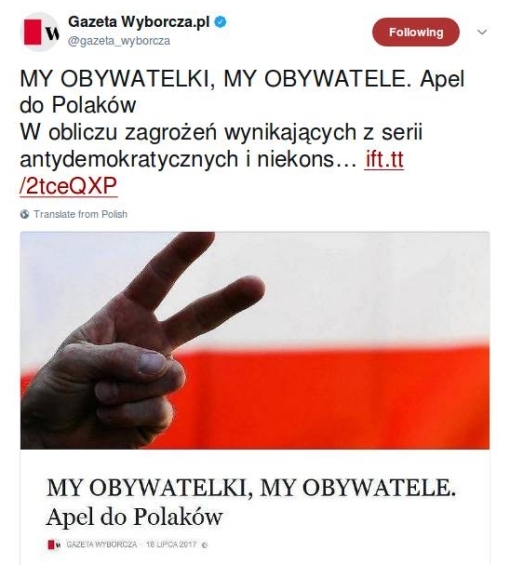 Gazeta Wyborcza is among the most independent of them, as befits a truly historic newspaper whose genesis lies back in functioning as a hastily put-together news-sheet back in 1989 meant to let the people know who were the Solidarity-approved candidates in Poland’s first post-WWII (partially) free election of early June. We the female citizens, we the male citizens. Appeal to the Poles: In the face of the threat arising from a series of anti-democratic and non-constitutional decisions of the PiS government, we stand in defense of the basic freedoms belonging to every person and resident of the Polish Republic. This goes on for a couple more paragraphs; the full (Polish) text is available here. Clearly this is a call to arms from among everyone in Poland to resist what the present government is trying to do. Leszek Belcerowicz, the famed economist and Central Bank governor responsible for the economic “shock treatment” policy of the early 1990s which laid the basis for the country’s impressive economic growth since then. Then there are many other names that I don’t recognize, but they are likely to be as impressive within Polish society as well. In short, these are historic, fraught, vital times for the preservation of Polish democracy. I’ll be keeping an eye on happenings from this, my EuroSavant perch and passing on the most important developments. This might be considered as the most important “secret” result of that NATO summit at the end of last week that was held at some golf resort in Wales, and the EU Beobachter (“EU Observer”) has picked it up. Yes, in the wake of that summit five states intend to start selling weapons to the Ukraine, and they are: the USA, Poland, France, Italy and Norway. The notable absence on this list is Germany, whose weapons, notably its small arms, are particularly good in comparison to most others, but whose Chancellor, Mrs. Merkel, made it clear at that summit that it was not ready to take that step. Understandable: the German government only in the past few weeks decided that it would break precedent and send arms to the Kurds fighting the Islamic State in Iraq, and that decision caused quite a bit of consternation on the German political scene. Merkel was not ready for the same again – not that that was the only reason for German reticence. What’s really notable about these arms-sellers is just how hush-hush the whole subject is. None of these countries has been willing to announce these upcoming weapons-sales; indeed, all have officially denied they are ready to do so. So who knows? Against that we have – for what it is worth – an announcement yesterday by a close advisor to Ukraine President Poroshenko that these five countries would indeed be supplying his country militarily. That announcement notably appeared on the advisor’s Facebook page. UPDATE: The BBC caught the “10 Theories about Flight MH370’s disappearance” meme around the same time as Gazeta Wyborcza (discussed below), so I would be remiss to not refer you to their piece, which of course is in English and also extensive (and fanciful, in places). It’s amazing to realize that, come Friday, it will be a full two weeks since Malaysian Airlines Flight MH370’s complete disappearance from Southeast Asian skies, with a “Good night” from the co-pilot (local time was just past midnight) the very last message received, some forty minutes in. With some sources saying that finding the plane could still be a matter of weeks, one can only marvel at the patience of those actually sailing in or flying over the areas of the Indian Ocean now being searched, gamely putting up with what must be an excruciatingly boring needle-in-a-haystack ordeal. What’s more, there is as yet no sort of confirmed explanation for what exactly happened. But at least accessing the foreign press can help one plug into that greater “hive mind” out there in the world to at least start evaluating possibilities. “In Łask, the Americans have NOT landed,” it reads. Well – yes they have, yet they also have not. Łask is a Polish village just to the West of the city of Łódż, whose only claim to fame is that it has an airbase. There, the American and Polish air forces recently staged a joint ceremony – you can click through if you’d like to see the photo – marking the arrival of 16 American F-16 fighter-bombers and associated personnel, flight and ground (among which, strangely, only 10 pilots). This is noteworthy because, as the article notes, it is the first permanent stationing of US armed forces on Polish soil. How do you know when your foreign campaign trip is not going well? When there are headlines like Today Romney visits Poland. Will there be further gaffes?, to be found today atop a piece by Mariusz Zawadzki in Poland’s most preeminent national daily, Gazeta Wyborcza. Warsaw is, of course, among those “capitals of Europe.” Sigh. Once, he recalls, Europe was America’s most important ally, even for Republicans. But that was mainly during the Cold War; now we have international economic crisis instead, with what is now depicted as a decadent, decaying “social Europe” with its scandalous levels of government debt financing health care for all. None of this past baggage bodes well for Romney’s visit, even as it is his “last hope” for achieving some sort of positive PR accomplishment out of his foreign junket. We’ve already had a furore about “Polish death camps” during WWII, not that long ago and out of the mouth of the President – surely Romney can at least avoid making that same mistake? Then again, he will be meeting in Warsaw with Lech Wałęsa, a figure as prickly as he is historical and world-renowned. That encounter could turn out to be a minefield, even as Wałęsa speaks no English – let’s hope that the translators will be skillful not just in language but in protocol! And that Romney at least remembers the old Solidariność leader’s name, something he failed to do when meeting with British Labour Party leader Ed Milliband! UPDATE: I’m now made aware that Romney traveled initially to Gdańsk on Monday, 30 July and continued on to Warsaw the following day. “Putin threatens America,” is what we get from Gazeta Wyborcza. So what’s that all about, and is there really anything to it? Well: yes and no. It is true that there is a new irritant in Russo-American relations, and that is the Magnitsky Bill, now before the US Senate. Its purpose is to punish Russian “human rights violators” (mainly those involved in the 2009 death in prison of anti-corruption fighter Sergei Magnitsky, but also others) by denying them visas to the US and freezing any of their US-held assets. Vladimir Putin’s “threat,” according to the Gazeta article, is simply to come up with a Russian list of Americans to punish in a similar way, should that bill be passed into law. Reasonable, no? Well, the US prison system may not be the world’s most humane, but at least things have not gotten to the point where prisoners “inconvenient” to the ruling administration are murdered there under flimsy pretexts. So that’s where the seeming symmetry in the diplomatic retaliation breaks down. Unfortunately, Putin found a sympathetic ear with President Obama, who has shown a distinct lack of enthusiasm for that “Magnitzky bill” as an interference in his administration’s policy towards Russia. So in the end “Putin threatens America” is a bit overblown – one brave man’s death at the hands of his Russian jailers amounts to but an unwelcome irritant in Russo-American relations. Big mistake: President Obama marred his White House ceremony last Tuesday evening, during which he presented the Presidential Medal of Freedom to Bob Dylan, Madeline Albright, and other notables, with three fateful words: “Polish death camps.” These he uttered while awarding that medal to a representative of the now-deceased Jan Kozielewski, who during World War II actually had himself smuggled into and then out of the Warsaw ghetto and one of those death camps in order to report to the rest of the world what was going on there. Yes, they were “death camps,” but they were “Polish” only to the extent of being located in Poland. A better adjective is “Nazi” since they were set up, owned, run and operated by Hitler’s regime. Now this is interesting – if also a little obscure. One of the current lesser crises going on (so that you barely hear about it) is the erosion of the EU’s Schengen Treaty whereby a large subset of member-states allow travel among themselves with absolutely no border controls. Now this arrangement – formerly the pride of the EU, on par with the common currenchy – is on the back foot, mainly due to the flood of refugees coming from North Africa (a by-product of the “Arab Spring”) and the general loss of member-state confidence that the Italian authorities at the first line of defence can keep them out before they do get into Italy and thereby into the Schengen zone, from where they have many options for further uncontrolled inter-EU travel. France was loudly talking about re-imposing controls on its Italian border a while back, while Denmark has actually done so on its border with Germany – to the sputtering protests (with no attendant action) of EU authorities. In the middle of this, as the leading Polish daily Gazeta Wyborcza now reports, the EU Commission is likely to open up visa-free travel from Russia. Well, not really all of Russia – but rather that strange Russian enclave of Kaliningrad, stuck there between Poland and Lithuania, outside of Russia proper. Oh, and they won’t actually be able to go to Lithuania – just to Poland. And, to make it clear, there still will be border controls in place, these Kaliningradians (?) will just be able to go through them (presumably flashing their Russian passports) without having to go through the trouble of getting a visa beforehand. Then again, Poland itself has been within the Schengen zone for a while now; who knows where some of them will want to go on to from there? But the Commission is seemingly willing to take that chance and announce such visa-free entry tomorrow; according to the article (no by-line), it’s motivation is essentially that it feels sorry for the Kaliningradians, they must be so lonely: “to avoid the isolation of Kaliningrad from its immediate neighbors, it is necessary to ease the travel of its citizens.” Because that sort of isolation can’t be very healthy for any body politic. Don’t laugh: since Kaliningrad was first isolated this way by the independence of Lithuania in 1990, it’s been mainly known (when noticed at all) for the shady activities of all sorts going on there: weapon-smuggling, alcohol/cigarette-smuggling, the dispatch of freighters with suspicious cargoes, and the like. This is quite simply a gesture to persuade people there to start behaving themselves. The past weekend was a bit of a traumatic one for Poland, and on the surface it’s easy to understand why: Sunday was the one-year anniversary of the catastrophic plane-crash at Smolensk airport of the Polish government airplane that was carrying President Lech Kaczynski and almost 100 other members of government or other prominent VIPs to ceremonies meant to commemorate the 1940 Katyn Massacre, in which the NKVD (predecessor to the KGB) executed in the deep woods near that city around 20,000 members of the Polish intelligentsia captured in the German/Russian invasions of the previous fall. But it’s even worse than that: whereas the tragedy understandably united the Polish nation in grief, a year later that effect has worn off and instead the deceased president’s twin brother, Jaroslaw – who happens to head the opposition political party Law and Justice – is now trying to make political capital ahead of elections later this year by hinting at a Russian conspiracy to kill his brother, and by denouncing what he sees as the current government’s subservient attitude to the Russians. You would think that, for its part, the Russian government would welcome the improvement in relations with Poland that was the initial result of the tragedy and the common investigation both nations’ authorities then undertook, and so would try to prolong that any way possible. Or maybe not. For an article in one of the leading national newspapers Rzeczpospolita now informs us of a piece of trickery – petty trickery, at that – which would have elicited an approving nod from the likes of Lavrenty Beria, long-time head of the NKVD under Stalin. What’s worse, it took an on-site inspection by no less than Poland’s First Lady, Anna Komorowska, to reveal the transgression. Last Saturday she led a ceremonial delegation to the Smolensk memorial site, now meant to commemorate not only last year’s crash but the Katyn atrocity that indirectly led to it. There, the delegation discovered to their horror that a change had been made to the memorial plaque that had been placed there shortly after last year’s tragedy. Those of you out there who would like to try out your Polish can click here to see the before-and-after for yourselves, otherwise let me just inform you that the original Polish-language tablet was gone and replaced by a bilingual Russian-Polish one. OK, there’s nothing wrong with that per se, except that space had been created to fit the Russian in by deleting the text in the first plaque which had mentioned the Katyn atrocity, cited as “genocide” (ludobójstwo)*, together with the Russian government’s admitted responsibility for that. Naturally, the Polish government had never been consulted – because it would never have approved. The Russian authorities apparently just went ahead and made the change. Actually, it would have been more appropriate to consult the “Association of Katyn Families” since that was the name on the original plaque, responsible for putting it there. Instead, Polish President Bronislaw Komorowski will have a chance to “consult” with his Russian counterpart Dmitri Medvedev today on a number of things, including – one would expect – this plaque affair. UPDATE: Poland’s other mainstream national daily, Gazeta Wyborcza, is now reporting that the two presidents have found a solution to try to tamp down the public outrage in Poland over the Smolensk memorial plaque shenanigans. A competition! There will be a competition, run by the Polish Ministry of Culture, to come up with yet another memorial plaque, to be placed at there in time for the two-year anniversary of the tragedy next year – which, we can only hope, will proceed a bit more tranquilly, in both countries. *Of course the Katyn massacre per se was by no means “genocide.” That word unfortunately has been so overused by those out to make cheap political points that its original meaning and impact are truly under threat – and it is only roughly 67 years old! Currency reform: Back in Cold War times that phrase always sent a cold shiver of fear down the spines of those living in the Communist Bloc. What seemed so reasonable in the government announcements – hey, too many zeroes have accumulated on the currency through inflation, let’s simplify things by knocking some of them off all prices! – all too often turned out to conceal hidden measures designed to punish earners of “black” wages (by forcing them to go to official offices to exchange the cash hoard they were holding that was about to become worthless) or even simply eliminate large swathes of purchasing power from the economy (e.g. by declaring notes of certain denomination to be no longer valid). Citizens of what was then known as the “Free World” have by-and-large been spared such abuses. Indeed, here in the Eurozone we have the common European currency, a medium of exchange not subject to the whims of any one national government. What’s more, it was adopted on 1 January by yet another EU member-state, Estonia. Yet that was recognized by most observers as somewhat of a bittersweet occasion; taking up the euro does say important things about the extent of that country’s European integration, yet the sovereign debt financial crisis with which the EU has struggled for a little over a year has revealed several cogent reasons for a country to regret ever giving up its own national currency. But I’m not out to talk about any of those here. Rather, let’s get back to the “currency reform” scam: it’s the damndest thing how prices seem to rise whenever a country adopts the euro! You see, all prices, wages, etc. have to be converted then by a fixed conversion-ratio – for example, it was 2.20371 for the Dutch guilder – and usually the new price that results is not a very round number. No, much better to make it so – and do you think that merchants then round it upwards or downwards? Anyway: Welcome to the club! *Interestingly, grocery-store prices were mainly converted in a straightforward manner – mainly because Dutch consumer-rights organizations promised to watch them like a hawk! Wikileaks has now come to Poland: revelations from the massive dump of US State Department confidential cables have now come to the surface which – as has also mostly been the case in other contexts – do much to undermine the rosy picture of US-Poland solidarity usually presented for public consumption. Poles are now in a position to read all about them in summary articles coming out in both of that country’s prestige nationwide dailies, namely Rzeczpospolita (coverage by Wojciech Lorenz) and Gazeta Wyborcza (by Marcin Górka). Poland had already shown up as a bit player in another Wikileaks dispatch from earlier this week, revealing new NATO contingency plans to make extensive use of that country’s transportation infrastructure to shift troops to the Baltic States should they be invaded by Russian forces. (Polish soldiers would also be heavily involved, in the form of at least one of the nine divisions slated to be included in any such maneuver.) But the only really new element disclosed in that connection by the Wikileaks dump was a certain dissatisfaction among Polish political and military authorities over the plan, since in such a situation Russia would by definition be at war not only with the Baltic States but also with Poland and with NATO in general, and such a commitment of resources would necessarily thin out Poland’s own defences somewhat. There was one catch, however, as we are only know finding out thanks to the Wikileaks dispatches: those Patriots can defend Poland against airborne threats coming from Iran, Russia, or anyone else only if they are equipped with bona fide live missiles, which for the majority of their presence on Polish soil they have not been. Indeed, these communications make clear that the concept for the Americans the whole time was for the Patriot contingent in Poland (stationed in some patch of wilderness up in the Northeast, near the border with the Russian Kaliningrad enclave) to be only a training post – fly Patriot crewmen in there on occasion just to get some practice in wartime deployment to a more-exotic location to the East, work a little with what amounted to only mock-up equipment, and then get out of there again back to their home unit. Naturally, the level of permanent personnel stationed there reflected this role, usually numbering only around 20 or 30 whereas Polish authorities had expected something more like 110, reflecting staffing for a ready-to-go combat unit. It’s something, then, but it’s not much – and it certainly is nothing that would stop Russian aircraft or missiles should the need arise. But it was all that Polish authorities found themselves able to get out of the American government, and they did their complaining quietly (e.g. about getting nothing better than “potted plants”) while never letting up on efforts to try to get even more of an American deployment of forces to Poland, and maybe with some actual combat-teeth for a change. Ideas that have arisen along this line are stationing some F-16s on a Polish airbase and/or maybe some C-130 transport aircraft and/or maybe even moving a detachment of Naval Special Warfare troops from Stuttgart to Gdansk. As it happens, Polish President Komorowski will have the opportunity today to discuss such things as he visits President Obama at the White House. But the shine is already considerably off the encounter after these latest revelations of the fast-and-loose behavior American military and diplomatic authorities display towards even the country’s closest allies (e.g. still with its own troops fighting shoulder-to-shoulder with American forces in Afghanistan). So that will be 16 F-16’s (how symmetric!) and 4 C-130’s (all American-manned and -operated; this isn’t an equipment sale) stationed on a Polish airbase starting in mid-2013. And if you click through Gazeta’s link to the article you even can see, amid all that Polish, a nice photo of Komorowski chatting with Obama in the Oval Office. On Sunday 3 October the run-off election is scheduled for Mayor (Oberbürgermeister) of Potsdam, that city of around 150,000 inhabitants just to the southwest of Berlin which was Frederick the Great’s capital and garrison-town and now is the capital of the state of Brandenburg. There’s a run-off because in the regular election, last Sunday, no one candidate got a majority of the votes, so the competition has now been narrowed down to the top two. Lying as it does within the former East Germany, Potsdam is not surprisingly a rather left-wing place, so it’s no surprise that those two candidates represent Germany’s main leftist party, the Social Democrats (SPD), in the person of incumbent Oberbürgermeister Jann Jacobs, and the formation even more to the left, namely The Left (Die Linke), represented by one Hans-Jürgen Scharfenberg. 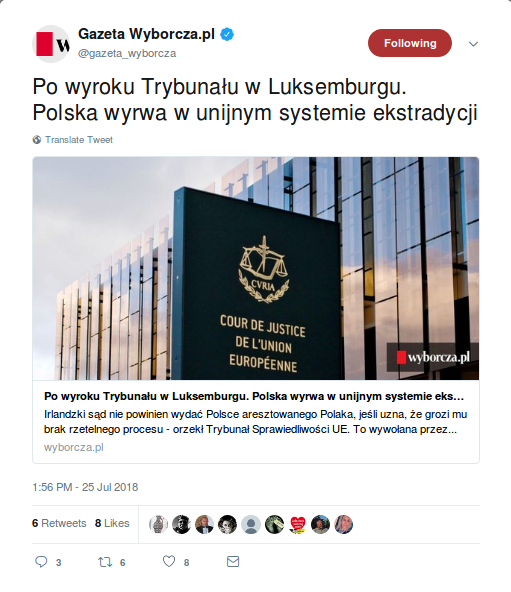 PressEurop yesterday came forward with an obscure piece of news from Poland that may nonetheless soon resonate internationally. Citing an article in that day’s edition of the mainstream Polish national daily Rzeczpospolita, they noted that no less than Polish ex-President Aleksander Kwaśniewski, his ex-premier Leszek Miller, and an “ex-head of intelligence,” one Zbigniew Siemiątkowski, were facing the prospect of going before a State Tribunal on war crimes charges stemming from the secret prison they allegedly allowed the American CIA to set up in their country back when the “War on Terror” was at its height, and which might well have been the scene for prisoner torture. Good work, that, although the PressEurop editors did somehow miss within that Rzeczpospolita piece the credit that journal was willing to give to its arch-rival Gazeta Wyborcza for actually getting the scoop, in the form of this article which appeared the day before the Rzecz report. Also, Zbigniew Siemiątkowski was not “head of intelligence” but rather Minister of the Interior; and there is another ex-Minister of the Interior who is under investigation in this connection as well, one Krzysztof Janik. Here’s something else that you may have forgotten about – the Demjanjuk trial, still ongoing in Munich, Germany. John Demjanjuk is alleged to be “Ivan the Terrible,” the brutal guard and gas-chamber operator at the Nazi death camp at Sobibor, and was finally extradited from the US to Germany last May for trial, to face a mere 27,900 counts of acting as an accessory to murder. Fine, so they finally have him on trial in Germany. (After he had already stood trial in Israel in 1986, it must be admitted – he was found guilty, sentenced to death by hanging, but then his conviction was overturned on appeal by the Israeli Supreme Court because of new evidence that had surfaced that cast doubt on Demjanjuk’s wartime identity.) Let’s just let things proceed from there, and expeditiously: by now, the most urgent consideration is probably to actually complete the trial before the 90-year-old Demjanjuk finally dies. One of the blocks of the Volga-Don Atomic Electric Plant in the vicinity of Rostov-on-Don was closed down after there occurred this morning a ruptured pipe in the steam generator. The plant’s director, Aleksandr Palamarchuk, has assured the press that there has been no damage involving radioactivity, and that radiation readings are “within the norm.” It is planned to get the malfunctioning block started again in about four days’ time. Interestingly, this plant does not seem to be of the type of old Soviet-style reactors that we’ve heard of before (e.g. Chernobyl), as it was put into operation only nine years ago, and already provides about one-seventh of the electric power consumed in southern European Russia. Nonetheless, it had a problem before, just last month in the very same sub-block, which meant that that part of the plant has been producing minimal levels of power since that time. Now it’s producing nothing, due to that “ruptured pipe” (pęnknięcie rury). The biggest news reverberating around Central and Eastern Europe (CEE) these days is that of an open letter recently made public, addressed to President Obama and issued in the name of 22 notable political figures from countries of that region, including many ex-presidents and even one Nobel Prize winner (Lech Wałęsa). Nobody who signed this missive currently occupies any actual governmental position, however, but that is perfectly logical in view of its polite but urgent message that any current official would have to be too diplomatic to deliver: America is neglecting NATO in general and the CEE lands in particular. Finally independent from Mama: Poland’s former head of government Jarosław Kaczyński can undertake his own money-matters from now on – he has opened his first account in his own name. That’s right, for many years previously – ever since he had money of his own that he needed to bank, one presumes – he has used his mother’s account. He continues to live with her, at age 59, and has never married – which almost goes without saying, for you don’t live with mother when you have a wife, even in Poland, when you are currently the chairman of one of the country’s main political parties and previously served not only as prime minister but as chief-of-staff to Lech Wałęsa when he was Poland’s first democratically-elected president. “Georgia – again?” Well, yes. What else would there be? The Republican National Convention? Coming up (we think). Sarah Palin? Not today, but definitely stay tuned on that one, it could turn spectacular. Hurricane Gustav? The European viewpoint there is probably not too interesting, even if we might be somewhat honored by the choice of that quintessentially (Central) European given name for bestowal on the storm. My best sense of the EU’s official position on Gustav – gathered from that extensive trawling through the various national presses that I do for you on a continual basis – is that it’s taken to be a bad thing, definitely. Everybody On Board for the Parade! I don’t like to talk about local affairs here except on rare occasions; this is hardly intended to be any sort of “Amsterdam blog.” One of the few things I’ll make an exception for is the “Gay Pride” festival occurring here every first week of August. It is known world-wide, to a considerable extent takes over the city, and features a unique “parade” on the Saturday (today!) that makes its way along the city’s canals (actually, mainly the Prinsengracht), not its streets. I’m back – perhaps in a bid for small-screen immortality? But be advised that this is going to be a day-to-day decision – or, more likely, even week-to-week. Poles in Iraq XI: Poles Out of Iraq? “He forgot Poland” George W. Bush famously complained during that first presidential debate last week. And so John Kerry apparently did. And what about Poland, and specifically its roughly 2,500 soldiers now serving in Iraq? We’re out of there by December, 2005, no matter what happens, is the essence of what Polish defense minister Jerzy Szmajdzinski announced in an interview published yesterday in the leading Polish national newspaper Gazeta Wyborcza.